As I’ve discussed in some of my previous posts, creating a non-clustered Columnstore index will make the index as well as the base table read-only. Which means you can’t insert, update, or delete any data until your drop the index. This may seem like a huge issue, but in reality it’s not that much of a problem. Keep in mind the Columnstore index feature is targeted at data warehouses that modify data infrequently. In the examples below, I go through two methods you can use to edit your read-only data. 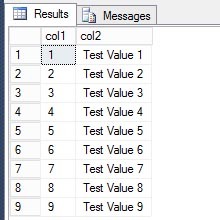 To get started, we need to create a test table and insert a few rows. Next, we’ll add a non-clustered Columnstore index to the table. At this point, we have effectively made this table read-only. We can read from it all day long, but if we attempt to update a value, we will get an error. Msg 35330, Level 15, State 1, Line 41 UPDATE statement failed because data cannot be updated in a table that has a nonclustered columnstore index. Consider disabling the columnstore index before issuing the UPDATE statement, and then rebuilding the columnstore index after UPDATE has completed. Once again, I love Microsoft’s error message. It gives you very good information on one method to use for changing data in a non-clustered Columnstore index. Disabling the non-clustered Columnstore index gives you the ability to make changes to the data; however, it can’t be used for any queries while it’s disabled. I like to wrap all the commands into a single transaction using the XACT_ABORT option. This guarantees that any error will rollback the entire set and not just one single statement. Looking at the table again, we can see the first row was definitely changed. This is probably the easiest method to change your data; however, it’s also the most resource intensive. 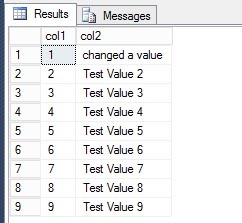 SQL Server will need to rebuild the index for the entire table not just for that one row that we changed. So if your table has millions or even billions of rows, it could take a lot time to rebuild and utilize a lot of resources. This is probably something you don’t want to do in the middle of your business day. The second method we’ll cover, involves using partition switching. First, we’ll create the same table but partition it into 3 parts. This table has the same data as before, but internally it’s partitioned. Using sys.partitions to get the details, you can see there are a total of 3 partitions, each with 3 rows. To use partition switching, you have to create a non-partitioned table that matches your partitioned table in every way; including all the indexes and constraints. For this example, we need to edit row 1 that resides in the first partition, so we need to create a non-partitioned table that has a constraint that mimics the first partition; col1 <= 3. Once we have the table created, we can perform the switch. Finally, all we have to do is just switch that data back into the partitioned table. I know this may look exactly like what we did in the first method, and it is. However, by having our initial table partitioned, it gives us the ability to only rebuild the non-clustered Columnstore index on smaller subset of data instead of the entire table. If this partitioned table had millions of rows, then that ALTER INDEX REBUILD command might only need to run against a fraction of those rows and therefore complete much quicker and utilize far fewer resources. 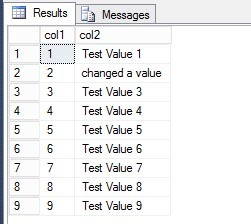 Not only can both of these methods can be used to edit existing data in a table that has a non-clustered Columnstore index, but they can also be used to insert or delete rows. On a final note, I will recommend that you always partition any table that has a Columnstore index. This feature is designed for very large tables, and having it partitioned gives you much more flexibility than if it’s not. And not just for working with Columnstore indexes, but other tasks as well. You can read more about Columnstore indexes and partition switching from Books Online. As I’ve discussed in some of my previous posts, there are quite a few data types that cannot be part of a Columstore index. 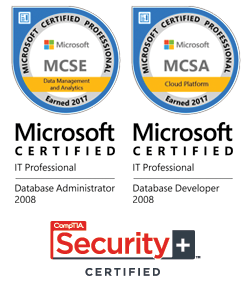 While there are fewer restrictions in SQL Server 2014, they still exist. I find myself constantly looking back at Books Online trying to make sure data types in my tables don’t contain any of those restricted data types. It would be much easier to know from day one which tables I need to redesign, or at least which columns I need to exclude from a non-clustered Columnstore index. This is why I have created the following script. 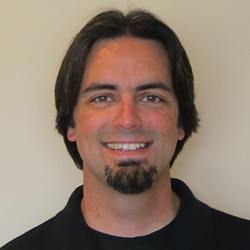 -- Find columns in user tables that cannot be included in a columnstore index. -- These restrictions apply to both clustered and non-clustered columnstore indexes. Running this against your database will output an organized list of tables along with the column name and data type that cannot be used within a Columnstore index. The script can be used if you plan to create a clustered or non-clustered index, since the data type restrictions would apply to both. The script can also be used to analyze databases in either SQL Server 2012 or 2014. You can read more about the limitations and restrictions of Columnstore indexes in Books Online.